Often the format and content of ‘off-the-shelf’ safety sign and safety label designs will not convey the exact information you need to communicate to your intended audience. “Close” is not good enough. When your sign or label does not accurately convey the nature of your hazard or the measures needed to avoid your hazard, accidents are more likely to happen. Whether you’re in need of a safety label to warn about hazards related to your products or you need a new safety sign system for your facility that’s up-to-date with the latest standards, Clarion is your expert resource to accomplish the task. Our staff’s knowledge of the latest best practice standards, and how they’re practically applied to communicate essential information, will help you create custom safety signs, safety labels and safety markings that meet your specific needs. Our experience. For over two decades, we’ve worked with thousands of clients in 180+ industries to design and produce signs and labels for an incredibly wide variety of safety concerns. When you work with Clarion, all of this experience is brought to a focus on your individual company’s safety communication needs. With a track record of having created over 100,000 designs, 50+ million signs and labels, and 0 client lawsuits for “failure to warn” or “inadequate warnings,” we’re your trusted partner in this field. Our expertise. Clarion’s custom and standard safety sign and label designs benefit from our two decades-long standards leadership on the principle ANSI and ISO safety sign committees. In addition, we’ve led numerous industry-specific standards initiatives, from semiconductor manufacturing equipment safety labeling to developing effective photoluminescent stairwell markings for NYC’s skyscrapers after 9/11. Our dedication to the standards development process gives you unprecedented access to the highest level of expertise in the field – so that what you purchase from us reflects the latest best practices. We’re proud to be able to say that, when it comes to both standard and customized safety signs and labels, no other company works at this level of expertise. Below are just a few of the customization options available for you. 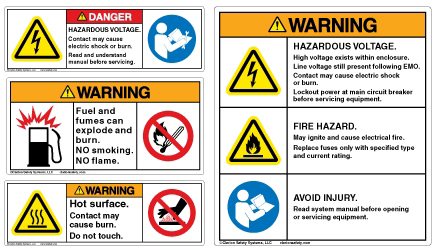 Multi-hazard safety signs and labels incorporate multiple messages into a single design. This type of formatting is useful to reduce “sign clutter” and make installation easier. Using a standards-based approach, Clarion can customize your sign or label to have as many text messages and symbols as you require. 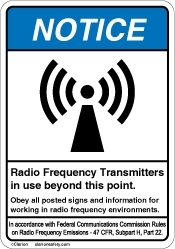 Additional symbols can be added to a safety sign or label to communicate more information in visual form. Symbols are the new language of safety, better communicating important information to an international audience. Your customized safety signs and labels can show additional hazard symbols and/or symbols that visually convey hazard avoidance procedures. Safety notices convey general safety information not directly related to personal injury, such as installation or maintenance information, or information related to accidents that result in equipment damage. We can customize your safety notice signs and labels to meet your exact requirements. Safety instructional messages are custom tailored to convey specific procedural information. 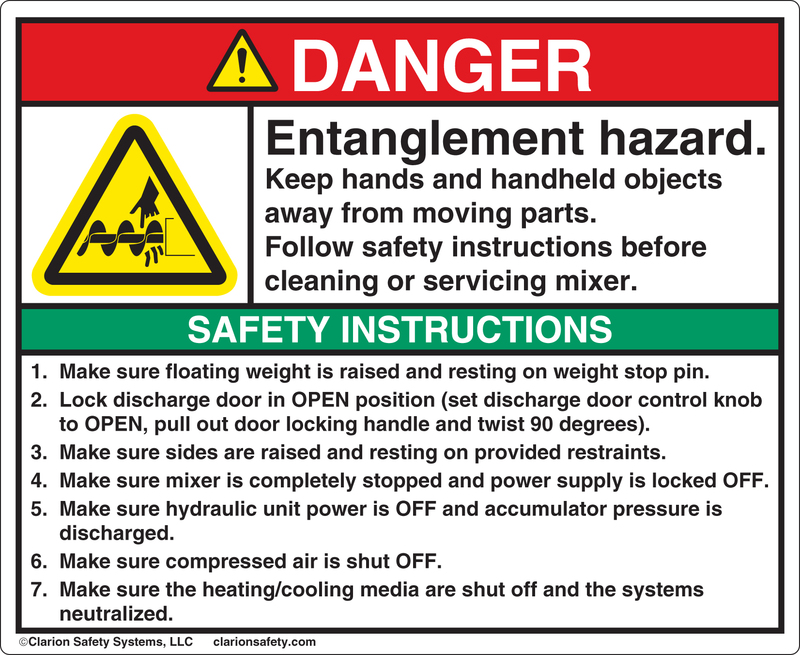 Note that the ANSI Z535 standards allow the signal words “SAFETY INSTRUCTIONS” to be made more specific, like “SAFE BOILER SHUTDOWN PROCEDURE” or “LOCKOUT PROCEDURE.” We can create a separate SAFETY INSTRUCTIONS label or sign, or add this content as an additional panel to an existing or customized DANGER, WARNING or CAUTION label design. Symbol-only safety signs and labels are used to communicate safety messages across language barriers. Use of these formats works for simple messages; more complex messages may need to be reinforced with words or by training materials. Clarion can custom develop new safety symbols, if needed, and/or combine symbols to form a single, combined symbol-only safety sign or label design.